and New England! Please ask! 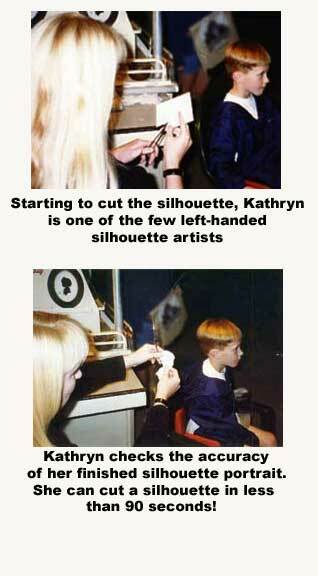 Kathryn, one of the foremost silhouette artists in the country, does instant portraits, using just paper and scissors, simply by looking at her subject. Although she can work from photographs, at parties, she uses no photos, shadows or sketches. Her beautiful, mounted silhouettes make great souvenirs for your guests. There is a 4-hour minimum for parties. 1. Who invented paper and paper cutting? The Chinese invented paper during the time of the Tang Dynasty, 700 AD. The Chinese also began the art of paper cutting, which later spread to Europe and the rest of the world. 2. Who invented silhouette portraits? A French bureaucrat by the name of Etienne de Silhouette created this form of portraiture in Paris, France in the mid- 1700's. Etienne was the French Minister of Finance, and was just as well-known for cutting "shades" of people as he was for cutting the budget to the bone. 3. Do you use a camera, laser, projector or computer to create a silhouette? No, silhouettes are hand- cut by using scissors and paper only. 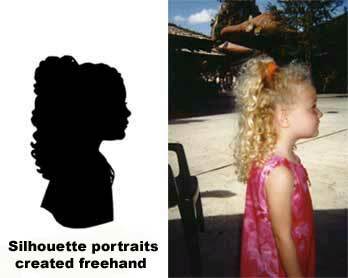 A trained silhouette artist just looks at the subject's profile, and cuts it out within a matter of minutes. 4. Where, when and how did you learn to cut silhouettes? I learned how to cut silhouettes in the summer of 1989 at The Magic Kingdom in Orlando, Florida. I started out as a paste-up helper, then became an artist later on. I carefully observed each artist while at work, then chose my two favorite artists. From there, I asked the two artists loads of questions about how they got started and if they had any pointers. I took their advice, came up with my own ideas as well, then just had to sit and practice and do the rest on my own. 5. Is there a set training method that all silhouette artist's use? No. Until now it has mostly been a word of mouth kind of art form, and the artist is left to glean tidbits of information here and there and mostly figure it out on their own through practice, trial and error. If a silhouette artist is really lucky, it is handed down to them from a family member who has decades of experience in the field. 6. Do they teach silhouette cutting in school? No, there really is no school that teaches how to cut silhouettes. The artist must learn the art form almost like an apprenticeship, under the direct tutelage of another master silhouette artist. 7. Where can you find silhouette artists? The bulk of the silhouette artists in the world can be found either at Disneyland, Disney World, Tokyo Disney or Euro Disney. Other than that, there are just a few silhouette artists scattered here and there on the planet. Some silhouette artists travel extensively, while others just do a few special events per year. 8. How long does it take an artist to learn how to cut silhouettes? I would say it depends heavily upon each individual's skill level as an artist and the amount of practice they put into it. I practiced 45 minutes a day for three weeks and got the basics down, and I was cutting for the public within 3 months. I built up my speed, accuracy, and individual cutting style, however, by about the 1 year mark. 9. 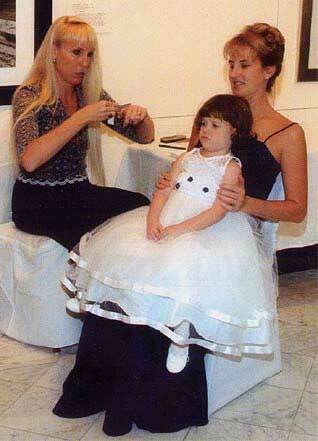 How long does it take a silhouette artist to cut out one portrait? A good silhouette artist should be able to cut out an accurate portrait within 90 seconds. 10. What kind of paper and glue is used? French silhouette paper is used, with a cellulose based wallpaper paste to mount the portrait down. 11. How many silhouettes can you do in one day? I can do anywhere from 50-100 portraits in a 6-hour shift, but with a paste-up helper those numbers can easily be doubled.